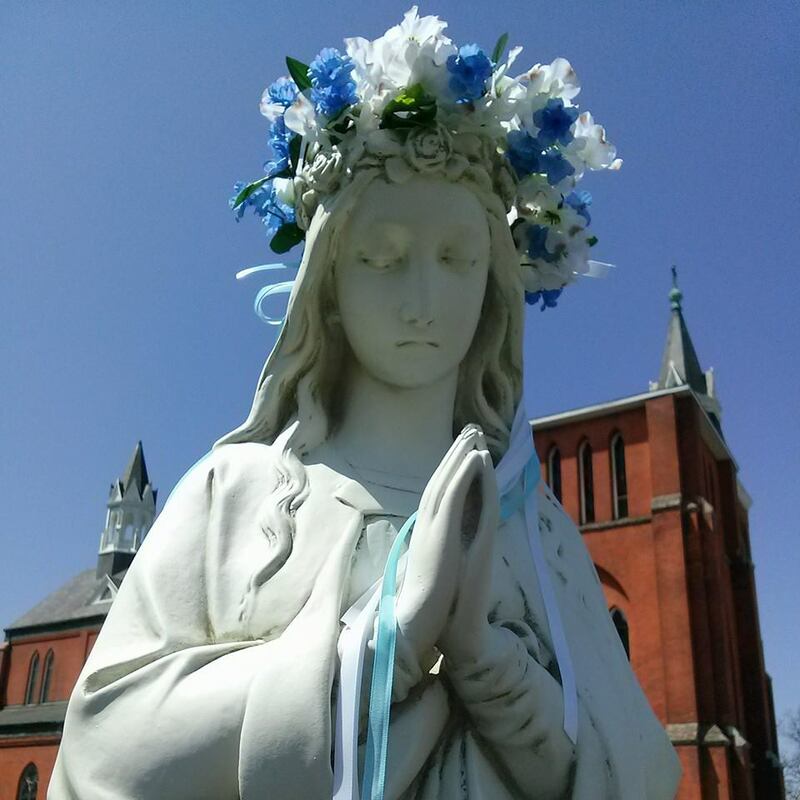 St. John Kanty Church - Buffalo, NY > News > News > TODAY, MAY 18, THE NEW MARY WAS BLESSED AND CROWNED! TODAY, MAY 18, THE NEW MARY WAS BLESSED AND CROWNED! The Mary Project, sponsored by the School Alumni Committee and kicked off in March, 2014, came to fruition today at the corner of Brownell and Swinburne Streets. Thanks to all who supported the project, not only with donations but with your presence. The turnout for Mass this beautiful day was very uplifting! Special thanks to Scout Troop 107 for their attendance and participation. Msgr. Bob Golombek came ‘home’ to Kanty’s…he offered Mass and the blessing of the new Mary; alum Doreen Poplawski, who crowned the old Mary 42 years ago, led the procession from church to the Grotto. First communicant Laura Kowalski placed the crown, made by alum Larry Lisiecki, on Mary, climbing the 6 ft ladder with ease. The choir, led by Larry Maguda, sung Immaculate Mary and Cześć Maryi . All in attendance then proceeded to Kanty’s Kafe to reminisce and enjoy cakes and coffee. It was wonderful to see four generations of the Siejak family as well as other friends from over the years! The Alumni Committee is grateful for the technical assistance of Randy Wagner, Wagner Monuments, for moving the school cornerstone into place, moving the old Mary, and mounting the new Mary; to Pilar Landscaping for removal of the old and overgrown shrubs, rescuplting the soil, and planting the new trees and shrubs, and to Pines Nursery & Garden Center for having healthy plants! Thanks also to the Committee members: Christopher Byrd, Diane Imbierowski-Czajka, Jennifer Snyder-Haas, Larry Lisiecki, Christopher Zdonczak, and Judy Felski for completion of a successful project!